With the Atlantic hurricane season well under way and Tropical Storm Harvey causing devastation in Texas, a new scientific study reports that coastal wetlands significantly reduce annual flood losses and catastrophic damages from storms. 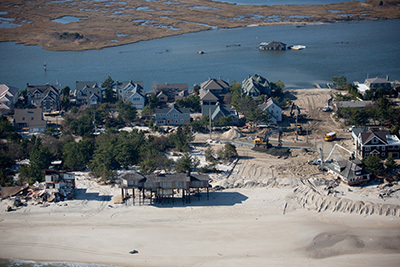 Led by a team of scientists from the engineering, insurance, and conservation sectors, including researchers at UC Santa Cruz, the study found that coastal wetlands in the northeast United States prevented $625 million in direct flood damages during Hurricane Sandy, reducing damages by more than 22 percent in half of the affected areas and by as much as 30 percent in some states. The study, published August 31 in Scientific Reports, quantified the flood reduction benefits provided by coastal wetlands across the northeastern United States during Hurricane Sandy, as well as the benefits provided annually in Barnegat Bay in Ocean County, New Jersey. It used the risk industry’s latest and most rigorous high-resolution flood and loss models and an extensive database of property exposure to show the correlations between property value and wetland presence, and between wetland extent and avoided flood damages. The vast majority of public and private funding for coastal infrastructure goes toward built structures (e.g., concrete), with only about 3 percent going to restoration of natural infrastructure (e.g., wetlands), according to a recent analysis by UC Santa Cruz researchers. The authors of the new study said their findings make a clear case for reallocation of this coastal investment portfolio, particularly after disasters such as Hurricane Sandy. The study showed a clear correlation between wetland cover and avoided property damages: the greater the extent of the wetland, the more protection it provides. 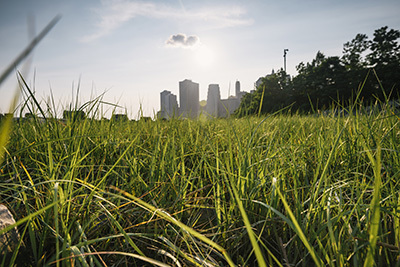 Even relatively degraded wetlands in highly urban areas like New York City provided hundreds of millions of dollars in flood protection during Hurricane Sandy, preventing $140 million in flood damages in New York and $425 million in New Jersey. In addition, the study demonstrated that coastal wetlands provide important coastal protection services year-round. Annual flood losses in Barnegat Bay, New Jersey, were 16 percent lower in places that had conserved their marshes than where the marshes were gone. In places that were 1.5 meters or less above sea level, the relative annual risk reduction benefits from wetlands were as high as 70 percent. The study was led by UC Santa Cruz, The Nature Conservancy, and the Wildlife Conservation Society in association with Risk Management Solutions and Guy Carpenter & Company, with funding from Lloyd’s Tercentenary Research Foundation. This partnership between the conservation, engineering, insurance, and risk management sectors was born out of the realization that coastal development and climate change will continue to increase the risks to people and property from flooding and storm surge, and that protecting coastal habitats can mitigate some of these risks. Coastal habitats are natural defenses that can help reduce risk in a cost-effective way, adapting to changes in the environment and providing multiple benefits to society. In a connected report from Lloyd’s, the partners identified how the findings in the Scientific Reports paper can be used to fund wetland conservation and restoration. Before a disaster strikes, investments in habitat conservation that reduce coastal risk could reduce premiums on insurance and insurance-linked securities (such as resilience bonds). In this way, habitat restoration could pay for itself in savings. After a disaster strikes, private insurance and public recovery funds can support wetland conservation, with the benefits of further reducing insurance premiums and building coastal resilience against future disasters. The risk and insurance industry can play a critical role in wetland restoration for disaster prevention and recovery. Quantifying the economic value of natural defenses will increase their relevance and inclusion in coastal management priorities. Although the risk-reduction role of coastal wetlands is often included in risk models, it is not clearly recognized by risk modelers, insurers, brokers, and clients. The risk-reduction role of wetlands can be straightforwardly included in the products of the risk and engineering sectors, and thus more readily considered in coastal development and habitat restoration decisions. The project was supported by the Lloyd’s Tercentenary Research Foundation with additional support from the Science for Nature and People Partnership (SNAPP).